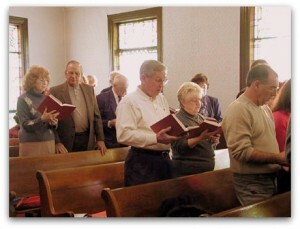 One of the great joys of a traditional local church is the congregational hymn singing. This is a time for the members to bring praise to God and to edify each other, and it is so enjoyable! The pianist can be a great help or a hindrance to this experience. A few of my piano teachers taught me a little about hymn playing, but I really progressed the most in my hymn playing by actually doing it. It’s an interesting thing, this hymn playing. 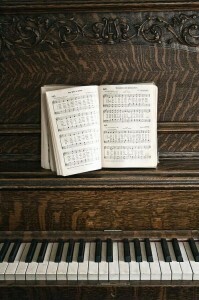 A student can receive a lot of information, some good techniques, and great advice, but there’s really no comparison to sitting at the piano with a congregation waiting for your support in their singing. I appreciate so much those gracious members and song leaders of my church who suffered through the early years of my hymn playing on Wednesday nights, because it gave me that needed experience to be able to do better each time. For those of you who are piano players, beginners or advanced, I want to encourage you to continue playing for your congregation! You are keeping a good and worthy tradition alive and playing a major part in the edification of the saints. I still have much to learn, and the education process is never ending. Along the way, I have learned some basic concepts that I hope will be a help to beginner hymn players. I wish I had known some of these things early on in my experience. If you can implement these into your hymn playing, you will be well on your way to excellence in this area. If you are an experienced hymn player, please give us your tips and advice here too! Let us know what helps you both in the practice room and in the auditorium. We all need to sharpen each other and glorify God through excellence. 1. The melody is king. The purpose of congregational hymn playing is to get the congregation to sing! It’s not a time to show off. This is a time for corporate worship. In other words, make it your goal to help the average non-musical member in your church to be able to sing the melody easily. Just keeping that mind-set will set the tone for your playing. In the same spirit of the last point. When the congregation is singing, that’s their time to shine. Runs, arpeggios, or fill-in chords are best used between word phrases as in whole note pauses or between the verse and chorus. An exception to this rule might be in a situation where you are not the only accompanist. If an organist or church orchestra is dutifully playing the melody, you might have the freedom to create your own counter-melody or further embellishment. Most often in my experience, the less I draw attention to my skill and the more I play in a way that actually helps the folks sing, the more the congregation enjoys singing. Most church members are very thankful for that. This includes song-leaders of any skill level. The song leader is the one in front of everyone, and their eyes are on on him, not on you. You are in a supportive roll. I know this is easier said than done if the director is hard to follow, but do your best to follow his lead. It is very difficult for the director to get the congregation to do something different than what the pianist is doing. So don’t do that to him! 4. Keep the tempo up. This may seem contradictory to #3, but you will need to find a way to do both. The reason I mention tempo to the pianist is because, like it or not, the pianist has tremendous control over how the song will go. You can be a great help to an inexperienced song-leader in this area. Usually if a director is inexperienced he will rely heavily on the pianist, so don’t let him down. Ritardandos are for the end of the last chorus, not for the introduction or the end of each verse. If you begin a song by slowing it down, it will be very hard to speed it up again, and slowing down the end of each stanza is counter-productive as well. Looking and thinking through a song before you begin will help you in setting the right tempo from the outset rather than trying to adjust as the congregation is singing. The only exception to this is if you are playing for a VERY large crowd. The larger the group, the slower the tempo needs to be because of the lag in sound accoustics. On the other hand, don’t speed things up too much either. You want the hymn to be “singable.” I tend to play “Praise Him! Praise Him!” too fast. The first two measures sound good, (Praise Him! Praise Him!…) but then we’re rushing through the next line (Jesus our blessed Redeemer). And there are songs like “It is Well” or “Holy, Holy, Holy” that are sung a bit slower, and it would be distracting to play it too fast. Keep a nice happy lilt if you can, but this can also lend itself to playing too fast. A song like “Heaven Came Down” can be easy to sing fast, but there are a lot of words in that song! Let everyone be able to keep up. 5. Keep the tempo steady. Remember too, to keep the tempo steady and easy to follow. Many songs in our hymnal can be sung as a solo, or perhaps you like to sing them at home in your own way. Songs like “Now I belong to Jesus” and “Amazing Grace” are easy to play with rubato, but in a congregation setting…keep it steady. Remember, we want to be easy to follow…not more difficult. Wrong notes are distracting. If you are a beginner in hymn playing, just focus on keeping the tempo and playing the correct notes. That really is the most important thing. As I said before, there’s really no way to learn except to do it. Find opportunities to play with a group of people and practice these concepts. 1. Play through your hymnal for familiarity and to see if you can sight read the songs if you need. 2. Sing while you are playing to help you know what is actually a good tempo for a particular song. It’s a good skill to learn anyway. 3. Learn to sight read. Does your church do the “Favorite Song” service? Yep. Learn to sight read. 4. Practice the fermatas. Will you do a run? Will you add just a couple extra beats with chords? Think about how your church normally sings a particular song, and fit your embellishment to that. Ask the director how he wants it done ahead of time if you can. 5. Practice for practicality. Rather than practicing showy runs, practice pick-up notes and ways to “bring in” the congregations to their beginning notes. 6. Practice in different “moods.” Can you play in a simple, contemplative mood for the invitation? How about the march-style songs like “Marching On” or “When We All Get To Heaven”? How would you play a triumphant verse? Think of the gospel song, “It is Well.” It begins with a nice normal mood and then progresses through a somber mood and then to the triumphant return of Christ. Most congregations will really try to sing that last stanza with gusto, so help them out with big chords. The chorus itself begins very quietly and simply, and then it ends triumphantly. Practice how you would do that. Hint: The more notes you play at once, the fuller it will sound. So learn those chords and fill in the missing notes as much as you can. I hope this give you some ideas whether you are just beginning hymn playing or if you are just seeking new techniques. God bless you as you support our congregations in singing praise to our God and in the edification of the saints. I love congregational hymns singing! Me too! Often it is my duty and responsibility, but really it is a joy and a blessed time for me. I wonder about your no. 3, Follow the Director. I tend to think of the director’s role as helping the congregation with their singing, rather than controlling the organist or pianist. After all, the organist has been practicing for weeks without the director — at least, that’s how it is in my church. So I see the director’s role as helping the congregation follow the organist. I am curious what type of church you attend. In many high-church services the organ is definitely predominate and there’s really little a conductor can do to overcome the power of an organ sound. In almost every traditional service I’ve been in though, the instruments are in a supportive role, not a leadership role. I’ve never liked overwhelmingly loud organs for that reason. Every director/conductor I’ve sat under (in any instrument) would be annoyed with me if I did not follow him, and some have even scolded me for it and rightly so. The instrumentalists may very well have practiced without the director by necessity. But we can’t say that an instrument has the roll of leader simply by virtue of the time and method they put in to practice. Someone has to be the leader, and the one directing seems a more obvious choice in my mind. In our Baptist circles the pulpit on the platform has been by design the focus of the service, so whomever is there needs to take the lead. In the UK at most churches the organist leads the worship. There are many strange unofficial rules which I have learned to bypass when they don’t work. My website and imminent publication clarifies what really works. It is subtitled You are the Conductor! And that is your role. It is a vital one. Get this wrong and the experience will diminish the worship. There are now many styles of hymn and worship song. The Complete Hymn looks at all of these. Thank you, Clive, for your comment. Perhaps it is a cultural and historical difference at work there. I’ve attended the organ led singing in London only once when I was able to visit Metropolitan Tabernacle. In that service the pastor himself remained in the pulpit during the congregational singing. However, due to the influences of men like Ira Sankey and Philip Bliss in the mid 19th century, traditional gospel singing in America involves a song leader who leads the congregation. The instruments are in a supportive role, although a very influential role. That is the perspective from which I’m writing. Sankey and D.L. Moody both attested to the tremendous influence the organist exerts (or pianist in most of today’s traditional services). However, Sankey once declined using a church’s organ because the large organ at the back of the platform “was too large, and too far away, and if I used it, I would have to turn my back to the audience while singing, and the song so rendered would not amount to anything.” He liked standing before the congregation to lead them in song. So I agree that the pianist is a vital role, but at the same time the one in the pulpit should do the leading. These were good steps, Rebekah. Very succinct and nicely written.